Or is an homage? Or just a kwinky-dink? 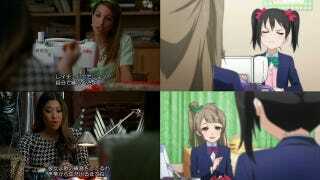 Whatever this scene from popular anime Love Live is, it sure resembles an episode of Glee. As pointed out on Japanese bulletin board 2ch, the recently aired sixth episode of Love Live's second season has a scene in which the characters are sewing costumes. One of the students (named Hanayo) makes a mistake while sewing, while another one (called Nico) is upset that they have to sew the outfits. Kotori then calms her down. On the 20th episode of Glee's third season, some of the students are sewing costumes. One student (Joe) accidentally pricks himself, while another student (Sugar) is upset that they have to make the outfits. Tina then calms her down. This episode originally aired in 2012 and has been released in Japan. Here, you can see a side-by-side comparison. Look how many of the shots lineup! This Love Live episode also has a changing-places scene like the Glee episode, and the ending also seems close to Glee's, with some of the anime dialogue appearing to be similar. One of the lines is apparently almost exactly the same. Online in Japan, some are calling the anime "Rip-Off Live," while others say this is an homage—especially considering how the anime recently parodied Kiss. Most seem impressive by the original 2ch user's knowledge of Glee.